After months of dieting to look your best for the big day you’ll be ready for a good old-fashioned feast the moment you’ve said ‘I do’. Whether you want a traditional sit-down three-course dinner and cake, an array of canapés, or something a little bit more unusual, here’s the complete guide to planning your post-wedding food. Whether or not you plan to employ caterers on your big day, a browse through some caterers’ sites on the Internet will be useful. If you do want your wedding catered professionally, this research will give you an idea of both the types of dishes available, and the costs per head, depending on the kind of food you want served. If you’re going to do the work yourself, use the sites as sources of recipe ideas and menu suggestions so you can start to budget for raw ingredients. Professional catering might cost more than doing the work yourself, but the convenience of having someone else worry about the cooking can outweigh the financial consideration. Unless you’re a gourmet chef, it’s likely that food cooked by caterers will be more imaginative and of a higher standard than anything you can produce. Catering firms also provide their own serving dishes, china, cutlery and utensils, so you haven’t got to scrabble around finding enough plates or spend any extra on renting them. That said, making your own wedding food is likely to save you a considerable amount of money – enough to treat your guests to a free bar, say, or at least a better standard of wine with their meal. If eating gourmet food isn’t a high priority for you, there’s no reason to employ someone capable of making it. Those planning wedding buffets can also ask several different people to prepare a few dishes each and so spread the labour. Three-course formal meals are traditional, promote a sociable atmosphere with everyone eating at a table together, and ensure guests feel well-fed afterwards. 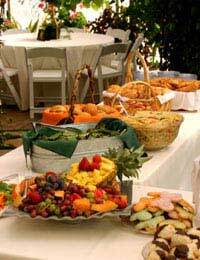 However, the expense of many caterers’ three-course menus can deter people from opting for a sit-down dinner. Actually, a formal meal needn’t break the bank – all you need is a sympathetic caterer and a bit of imagination. Foie gras and caviare might sound high-class, but a lot of people don’t even like them, so there’s no point ordering such luxuries for show. Spread the cost between courses by not opting for the most expensive things every time. Pasta dishes make great starters or vegetarian options, while chicken is versatile and much cheaper than beef or fish for the main course. And if you’re short of cash for desserts, you can always serve slices of wedding cake instead, with a dollop of cream or ice-cream. A strictly formal meal often includes supplementary courses – amuse-bouches to start, palate-clearing sorbets, and cheese before pudding. Caterers usually offer these courses at an extra charge on top of their set-price three-course menu. If you’ve got the cash, splash out and make your wedding meal one to remember by adding these elegant little extras as a treat for your guests. Don’t forget to budget for drinks to accompany the meal, as well as for your bar. Caterers may offer wine recommendations to accompany the dishes they’re cooking, but these can be pricey options. Buying your own booze on sale or return, with recommendations from the off-licence supplying it, will probably prove more cost-effective in the long run. Make your budget go further by eschewing bottled water as well. Even the most fashionable of restaurants have cottoned on to the fact that most diners are not bothered about whether they drink tap water or the expensive mineral stuff, so go for large jugs on each table with plenty of ice and just keep filling them up straight from the tap. If you’re having a morning wedding, why not make your wedding ‘breakfast’ just that? A traditional English country-house-style breakfast is a rarity today, so treat your guests to options such as smoked salmon, kippers, kidneys, kedgeree, fresh fruit and Bucks Fizz to go with their eggs, bacon and sausages. A buffet is more economical than a full three-course meal, because you’re paying for individual dishes rather than food per head. It also has the advantage of guests being able to choose what they want to eat at the time, rather than several weeks in advance of the day. Variations on the theme include an ‘international’ buffet, with food ‘stalls’ featuring different cuisines – Indian, Chinese, Thai, Italian etc., allowing guests to pick from a selection of hot dishes. Or go for a finger food buffet, with trays and trays of canapés that’ll give people the widest possible choice of snacks. Finally, if you’ve got a sweet tooth, consider the increasingly popular option of a ‘dessert buffet’ – an array of different puddings to complement your wedding cake. Remember, putting on a great spread for your guests will have a knock-on effect well into the evening – it’ll keep them seated during the speeches, fuel them up for dancing, and boost your reputation as great party hosts. So do the legwork to find the ideal food for you, get it cooked to perfection, eat, drink and be merry!